Portsmouth sophomore Jaiden Rickett looks for a driving lane early in the contest. Portsmouth head coach Kristen Bradshaw calls a play from the sideline. 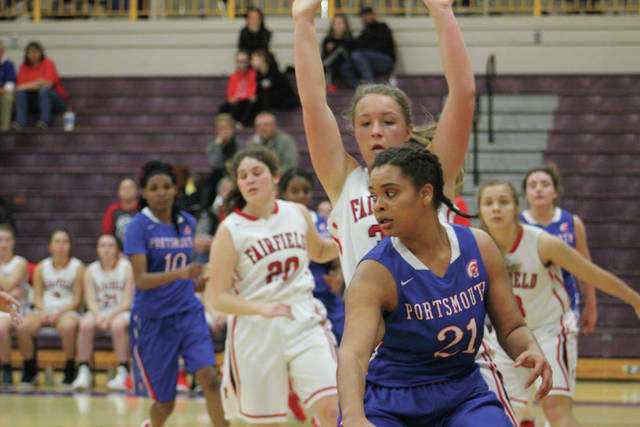 Portsmouth junior Jasmine Eley drives against a Fairfield defender. 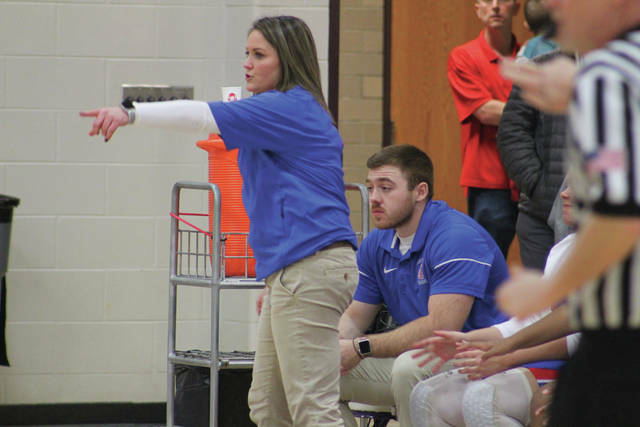 The Portsmouth Trojans met a tough Fairfield Lions squad in the sectional round of the girls basketball division three tournament at Valley on Wednesday. Portsmouth was able to keep the game within reach early, but ultimately it was Fairfield who pulled away in the final three quarters to capture a 67-21 win. With just one senior on the roster, the Trojans knew entering the season they would be a younger team and would have to grow up as the season progressed. Late in the year, Portsmouth began to hit their stride several games before the tournament, finished off with a big 43-41 win over Waverly last Saturday in their regular season finale. Early in the game, it looked like the Trojans were playing with a lot of confidence. Falling behind 4-0 early, it appeared Portsmouth would receive some help when Grace Shope picked up her second foul under four minutes into the first quarter. However, Shope stayed on the floor, and was tough to stop at that. 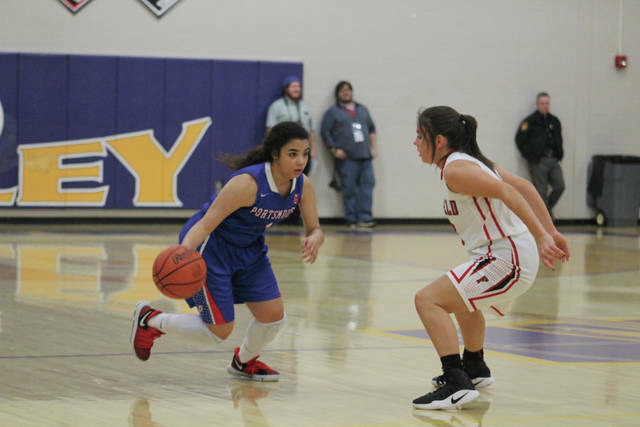 She would record a game-high 24 points in the contest, and was attacking from all areas of the floor for the Lions. Behind 11-4 with under a minute to play, the Trojans didn’t panic and began to tack on some points to the scoreboard. First, Jasmine Eley put the ball on the floor and headed to the rim. When Fairfield defenders swarmed Eley, she dropped a nice bounce pass to Kylisha Kearns for a layup. Kearns was Portsmouth’s leading scorer in the game with eight points, and was hard to handle inside. Her activity and tenaciousness gave the Lions issues throughout the game, especially when she had the ball in her hands. Fairfield answered back with a triple from Kami Magee, but the Trojans had a response up their sleeve as well. Coming right back was Eley, canning a three-pointer from long range with 16 seconds left in the first. Eley had five points overall. Late free throws from Shope made the score 15-9 after one, with Portsmouth right there in the midst of the action. In the second quarter, a steady dose of Shope and Samara Cannon was the key ingredient for Fairfield. Shope would score seven in the second, and Cannon knocked down two three-pointers to help grow the lead for the Lions. Cannon had 13 points in the game, one of three Fairfield players to score in double figures. Meanwhile, the Trojans were having trouble hitting shots of their own. Destiny McKenzie scored both baskets for Portsmouth in the period. McKenzie scored on a steal with 2:40 to play, fighting through the contact of a defender to send the ball through the net. Then, with 2:03 remaining, McKenzie made a layup on a feed from Eley. McKenzie, Eley, and Kearns combined for 19 of Portsmouth’s points in the game, and have been big as juniors for the Trojans throughout the year and their careers. Fairfield began to pull away in the second quarter, as the Lions led 28-13 at halftime. The third quarter was pivotal for Portsmouth. If they didn’t begin to cut into the deficit, it might be too late to try and mount a comeback. Realizing this, Fairfield struck for 23 points in the quarter, pulling ahead to a 51-19 advantage. Shope scored eight in the frame, while Cannon added seven. Beyond those two, four other players scored for the Lions in what was a balanced output. For the Trojans, they were able to muster up just six points as the struggles continued for them offensively. Kearns scored four in the quarter, and McKenzie added a deuce for the Portsmouth scoring. In the final quarter, Fairfield closed out the game with a sustained scoring balance. This time around, five different players scored for the Lions. Headlined by six points from Brianna Barnes, Fairfield would keep their scoring efforts up in the fourth. Barnes had 10 points in the game. Like the Lions, the Trojans inserted some younger players with the margin being too tall to erase. Freshman Mikai Dixon scored the only two points for Portsmouth in the quarter, hitting two free throws with 1:02 to play. As the buzzer sounded signaling the end of the contest, it was Fairfield who advanced with a 67-21 win. The Lions secured a meeting with the Wheelersburg Lady Pirates on Saturday at Valley. The game is scheduled to tip-off at 2:45 pm. It’s the end of the season for the Trojans, but Portsmouth showed numerous signs of improvement as the season went on. The Trojans will lose one senior in Sharia Kearns, who was a big asset for Portsmouth in her tenure with the Trojans. Though she was hurt during the season, she was still one of the biggest parts of the team. With a young nucleus of players set to return next year, it looks like Bradshaw will have a great foundation laid to make some noise in the 2018-19 season. Portsmouth has some great talent on their team, and could be a dangerous squad next season if they are able to get more in sync with one another and grow together. That chemistry was a point of emphasis for Bradshaw to her team following the game.